Welcome back to the November edition of the newsletter, and a Happy Thanksgiving to our friends in the States! This has been an incredibly busy month for the Tokes team, both on development fronts and with conference and business efforts. We have set some stringent milestones for ourselves by the end of the year which we are prepared to meet, particularly on the Merchant Gateway, discussed in more detail below! The Tokes Merchant Gateway is seeing a number of new developments and integrations in the closing months of the year. One of the most exciting is the integration of BTCPay Server, currently enabling both Bitcoin and Litecoin payment functionality, and allowing for more tokens/currencies to be easily integrated in the future. While clearly there is incentive for us to develop software solutions natively integrating our token, there is a clear benefit to building functional merchant ready software for the cryptocurrency ecosystem as a whole — particularly when there is a relative dearth of brick and mortar ready point of sale software available today. Lest we forget, wallets are not enough to prompt enterprise adoption of cryptocurrency, there must be full-featured, easy to use software that encompasses current business processes around tokenized transactions. With our present features and ongoing developments, the Gateway meets the software needs for standard consumer business practices! Ecommmerce integrations are also right around the corner, allowing merchants utilizing the Gateway to turn on a plug and play web store, or use plugins to their existing website for easy tokenized checkouts. Users may expect to see these integrations rolling out the first quarter of 2019. Additionally, integration with Metrc is nearing completion, Nevada’s reporting system for all cannabis business transactions. This will make the Merchant Gateway fully compliant with Nevada’s state reporting requirements, and any other state utilizing Metrc for cannabis business data. The Tokes team demonstrated our products at World Crypto Con October 31 and November 1, sharing a booth with our partner Vault Logic. 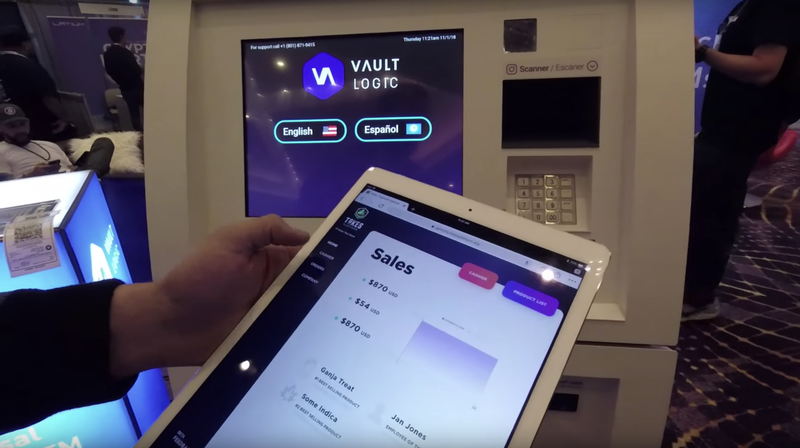 Here, booth visitors were able to experience the full consumer workflow of a Tokes payment, from purchase of the token using the Vault Logic Kiosk and Tokes Mobile Wallet, to check-out on the Merchant Gateway Software. We gave innumerable demos during our days on the floor at the conference, and made a great deal of introductions to both new potential Tokes users and die hard followers alike. Below you will find a YouTube video demonstrating the full walkthrough conference goers experienced at the booth (with who we shared some Tokes swag). The week of MJBizCon, Michael Wagner gave an informative presentation at CEF Talks here in Las Vegas Nevada. The Cannabis Economic Forum is an organization formed for the purpose of giving voice to the concerns associated with the emerging cannabis market. Their efforts give a formal platform for cannabis businesses, activists, lawmakers, and patients to discuss emerging issues and solutions amid the ever-changing business of cannabis. Michael’s talk primarily focused on the advantages of using blockchain based payments and data structures within the regulated cannabis space. See an excerpt of his presentation below. That wraps up this month’s newsletter. Keep an eye out this month for development releases, and have a happy holiday season!